The Guardian reported that the government has approved plans for the giant onshore wind farm in England and Wales which could power 206,000 homes a year. While this is a completely green energy source, it has come under criticism from countryside lovers, who said that the farm would be ugly and that it will ruin the beautiful landscape of the proposed site. With wind turbine standing at 475ft tall, I can't help but saying "Wow! This is one monster mill!" By comparison, London Eye is 443ft tall (135m). Closer to home, the Singapore Flyer's (big wheel) height is 541ft (165m). Image: The Telegraph. 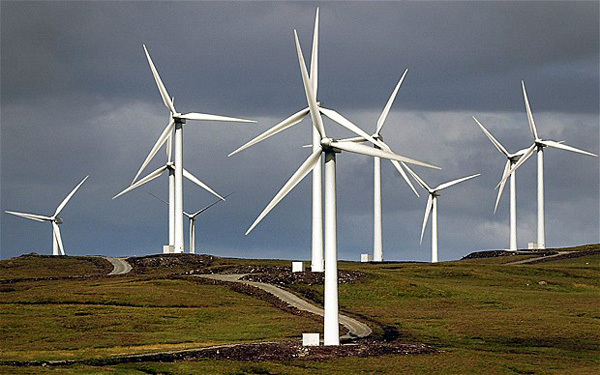 These wind turbines (Beinn An Tuirc wind farm) in Scotland has been criticised by many as unsightly. Vatenfall, the developer behind the project, also operates the largest offshore wind farm in England and Wales, which produces 300 MW of energy with 100 turbines. Another big offshore project near Margate, Kent, is already in the works by London Array and this farm would produce 1,000 MW from the 341 turbines. We know that the UK is a country suitable for harnessing energy from the wind. Last month, The Independent carried an article on British engineer Offshore Group Newcastle's optimism of creating up to 1,000 jobs from wind farm. It seems that erecting the bigger turbines are better done offshore, where the mixture of environment and the turbines can be better tolerated. Unsightly as some say it is, wind farming is more sustainable compared to the generating energy using fossil fuel. It is an idea, and people can continue to debate it but in the end one still need to decide what's acceptable to the bigger population in a long run. @Zoe. mungkin pasang kat dinding dapur lagi bagus. Kidding!